Assuming we can get humans all the way to Mars, how the heck do we land them on the Red Planet? The challenge is the atmosphere of Mars is very thin, making parachutes tricky. Heavier payloads require unique ideas to get them on the surface, such as the wild ride we saw for the Curiosity rover. Since humans and their cargo would have much more mass, one of the ideas NASA is exploring is something called the Hypersonic Inflatable Aerodynamic Decelerator (HIAD). And here’s the surprising thing — it looks a little like those donut toys that small children play with. The concept has been heavily highlighted in the media this week, but what is less spoken about is the uncertainty of the project. 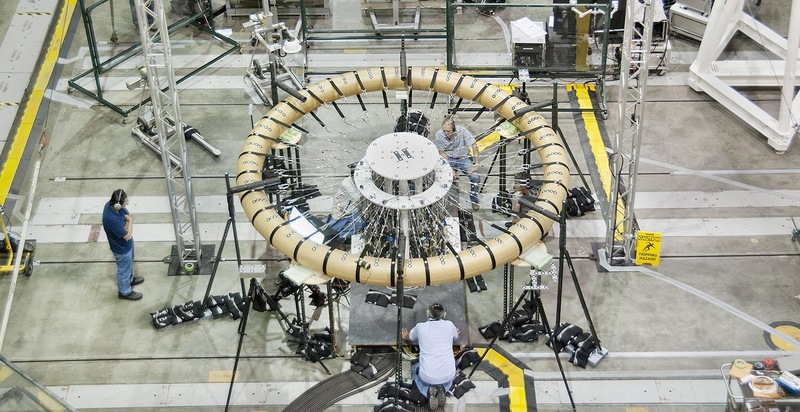 The June update came after NASA performed structural testing on a prototype in NASA Armstrong’s Flight Loads Laboratory for seven months in 2013 and 2014. And that was the end of a three-year project under NASA’s Game-Changing Technology program. What project officials hope for is that they will win a proposal to do more work in 2016. If that works out, they’ll perform more testing on the project. NASA says the technology could be available for use as soon as 2020, but we’ll have to see how things work out. The principal investigator for its materials and structure is Anthony Calomino, who is with NASA Langley. You can find more information on HIAD on this website.